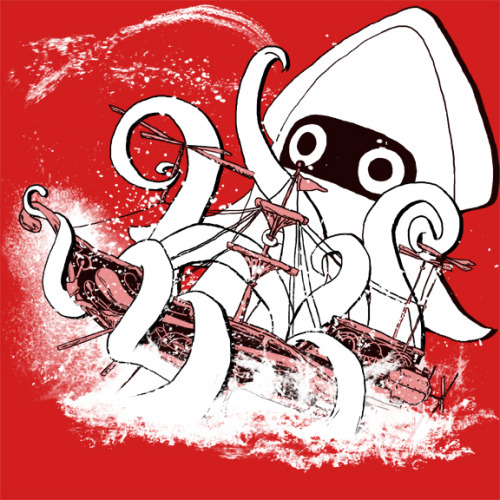 One of my fellow bloggers, Calvin of the Canadian Cave of Cool, has an interest in fighting against the Cephalopod Menace. He’d be glad to know that the most famous plumber in the video game world is contributing to this fight. In the original Super Mario Bros., one sort of enemy he faced was the Blooper. Well, actually, it was called a Bloober at that point, but later sources tend to go with “Blooper,” so I’m suspecting the original was a faulty translation. Bloopers are white squid that swim around, propelled by their tentacles. That’s all they do in this game, but later ones give them other powers. 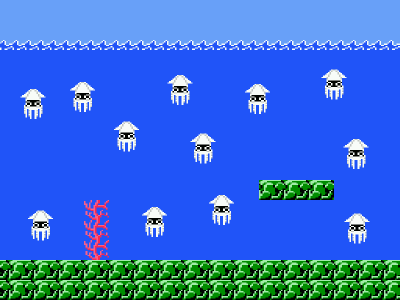 In fact, in the sequel eventually released outside Japan as The Lost Levels, Bloopers could essentially fly, although it is perhaps more appropriate to say they swam in the air. Super Mario Bros. 3 brought us Blooper Nannies with babies, and later games occasionally had them walk around on land. They also can sometimes spray ink in Mario’s face. Bloopers have been known to participate in sports titles, and one named Blooey even served as an ally to Luigi during his adventures in the Waffle Kingdom. The White Torpedo tended to get fed up with Luigi’s bumbling, but stuck with the green-clad plumber anyway. 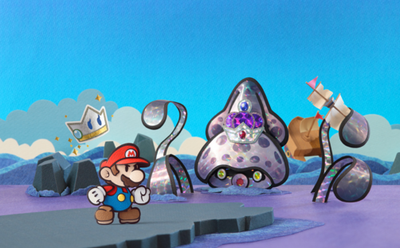 Leaders among the Bloopers include King Calamari from Super Mario RPG and the Gooper Blooper. The latter appears as a boss in both Super Mario Sunshine and Super Princess Peach. That about does it for the squid, but what about octopuses? They show up in the series as well, but not as often. One is a boss in Super Mario Land 2, and some others show up in the Super Mario Galaxy games. The galaxy-dwelling octopuses spit coconuts and fireballs at heroes, sort of like the Octoroks of Hyrule do with rocks. In Japanese, they have pretty similar names. The Octoroks show up in pretty much every Zelda game, so it’s not too surprising that they’d eventually make their way into Mario’s universe. Another variation on octopuses in the game world is the Octoomba, which is part Goomba. It appears that the octopus ruler is King Kaliente, who shows up in both Galaxy games as someone who has to be defeated by throwing his own coconuts back at him. Galaxy 2 brings in Prince Pikante, who might well be Kaliente’s son, or at least a relative of his. This entry was posted in Mario, Video Games, Zelda and tagged bloopers, gooper blooper, king calamari, king kaliente, octoombas, octopuses, octorok, prince pikante, squid, super mario bros., super mario bros. 3, super mario galaxy, super mario galaxy 2, super mario land 2, super mario rpg, super princess peach, the lost levels. Bookmark the permalink. Their evil truly knows no bounds. No wonder they make such an effective enemy for the boys. That was great. I just may have to do a post about this topic over at the Cave of Cool. I would be in favor of a post on this topic. Everyone needs to know about the danger posed by Bloopers! And in Dragon Quest 8, there are Khalimari, Squiggles, squid kids, giant squids, and king squids. The Final Fantasy series has several octopus villains as well, most notably Ultros in FF6.